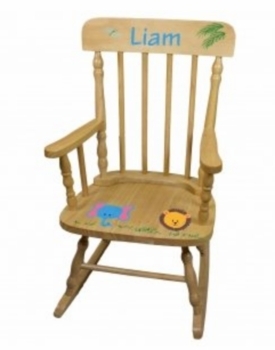 Available in Natural or Espresso finish, this is one of our most popular child�s rocking chairs because each one comes hand painted with the child�s name and your choice of artwork design! Each rocker boasts sturdy construction of durable Asian rubberwood with classic details like a high back, lathed spindles, a contoured seat and a white painted finish giving it a lovely Victorian appearance. This is truly a unique baby gift to be adored and used for many years. Click on More Images to see the chair in the natural and espresso finishes. We personalize each chair with a name and your choice of over 70 beautiful designs. All paint used is certified lead free. Please note: Adult assembly is required as the chair will arrive unassembled. The item photo displays our #70 Princess design. The chair measures 28 inches high by 18 inches deep and the seat sits 11 inches high from the floor. Please Note: As each chair is hand painted by one of our many artists, the artwork you receive will not look exactly as shown on the website. Each design will be a unique and a one of a kind version of the designs shown. Free shipping included. Personalization process on this product requires longer period of time and totally worth the wait! Please read the Description below the picture for instructions on how to choose your design.